Here's the most recently quilted, but not yet bound, quilt. I quilted it with my go-to loopy design in Aurifil 2600. Then today I pulled out all the stacked quilts and attached a slip of paper with the name of one of the first responders to each one. Here they are all together. Don't they look fabulous stacked up like this? When I wrote my One Monthly Goal post back at the beginning of the month, I was thinking that I'd also make quilts for the new RCMP and fire fighters, but when I messaged the fire chief about that he said that, while he appreciates it, it isn't necessary to include the new people. 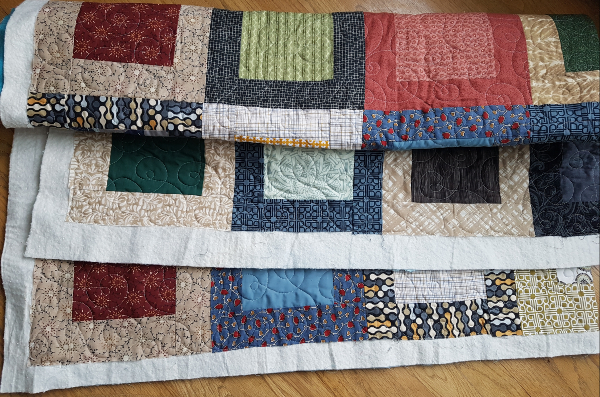 And since including them would mean piecing and quilting another 6 quilts, which would take me months since I'd have to fit it in around all of my other obligations, I'm inclined to agree with him. I am excited to be almost finished this project! It has been such a wonderful project and it was amazing to experience firsthand the generosity of this wonderful quilting community, but it will be nice to be finished and to cross it off my to-do list, finally. 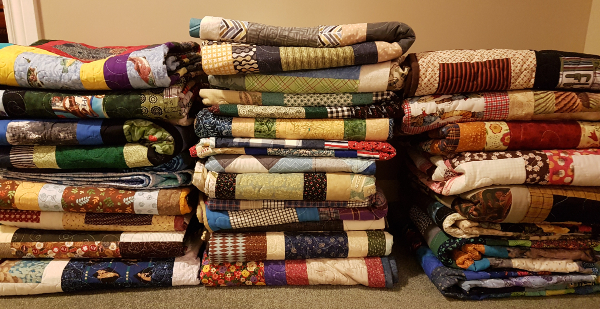 Giving the quilts to the first responders will also free up a bit of space in our house, lol. Well done!!! That was a lot of quilts for this project. The end is in sight. Yay! I'm so glad you did the count and were able to find that you are very close to your goal. You can do it! Hooray and congrats! What an awesome endeavor. Outstanding! Thanks for linking up with Elm Street Quilts One Monthly Goal and congrats on your finish.